Bumble, the female-first networking app, and Moxy Hotels, Marriott International’s playful experiential brand, have teamed up to launch ‘BumbleSpot #attheMoxy’ – fun, empowered locations at select Moxy Hotels nationwide where Bumble users can bring their connection from the digital sphere to real life. BumbleSpots are places that have been verified by Bumble as inclusive environments to meet your Bumble connections – across dating, friendship and professional networking. Moxy Hotels is Bumble’s first nationwide partner to be designated as a BumbleSpot, and more BumbleSpot locations will launch across the United States and Canada over the next year. BumbleSpot #attheMoxy will officially launch in New York at the new Moxy Hotel in the Financial District on November 13th. The evening will be hosted by actress, philanthropist, and entrepreneur Jaime King with music by sisters and DJ duo Coco & Breezy. Events will follow in Chicago on November 15th with DJ and founder of Style Native Brandi Cyrus and Wells Adams, who will host their “Your Favorite Thing” podcast live onsite. The Denver event will be held on November 29th with model, activist, and founder of the “No Wrong Way Movement” Denise Bidot. Guests at the launch events, which are open to Bumble users, will have access to Bumble’s famous Profile Doctors, who will help them get the Bumble profile seal of approval, inclusive of professional headshots taken onsite, and improv workshops with Moxy partner Upright Citizens Brigade to learn skills to break the ice on a Bumble connection. 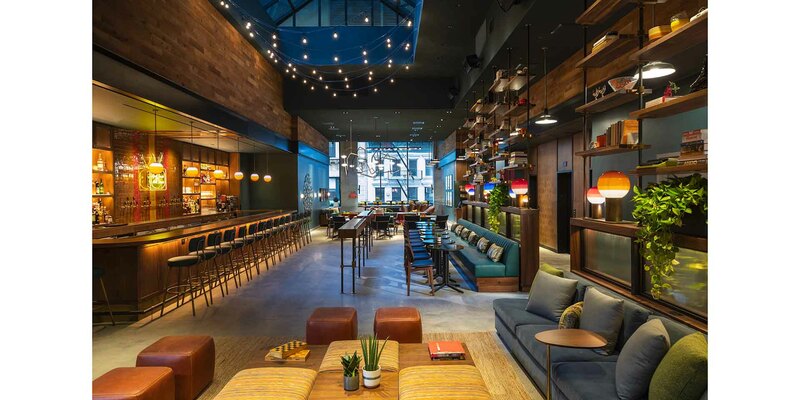 Five additional Moxy locations will participate in BumbleSpot offerings through the end of the year, including hotels in Seattle, New Orleans, Tempe, New York Times Square, and Minneapolis. Bumble users and Moxy guests visiting BumbleSpots through the end of the year will experience a number of fun offerings and benefits, including food discounts and a custom drink menu of 2-for-1 specialty cocktails from “My Fair Lady” to the “Stinger,” for those who show the Bumble app upon ordering. Moxy’s complimentary work spaces will also be available for Bumble Bizz users to empower the entrepreneur on the go. Additionally, there will be fun twists on some of Moxy’s regular bar programming, such as giant Jenga with Truth or Dare quotes on Jenga bricks to break the ice. Bumble was first founded to challenge the antiquated rules of dating. Similarly, Moxy threw out the hospitality rulebook and challenged the status quo. Together, these two brands are a perfect match to encourage people to come out from behind their screens and take their digital connections into real life – whether that be a date, a friend or a business connection.